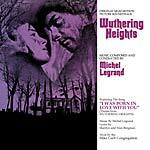 "Limited edition LP reissue of Michel Legrand's Wuthering Heights on transparent purple vinyl. The wealthy Mr. Earnshaw (Harry Andrews) adopts Heathcliff (Timothy Dalton), a young street urchin he meets on a trip to the city, welcoming the boy into his stately rural mansion, Wuthering Heights. Though Earnshaw's daughter Catherine (Anna Calder-Marshall) initially treats Heathcliff with disgust, the two eventually fall in love. But when Catherine's hateful brother Hindley (Julian Glover) returns home in the wake of his father's sudden death, it threatens to tear the young lovers apart. This is the original album presentation, with the addition of a previously unreleased track, digitally remastered from the original ¼' stereo tapes from the MGM vaults. This is the original album presentation. Limited edition of 300 LPs."